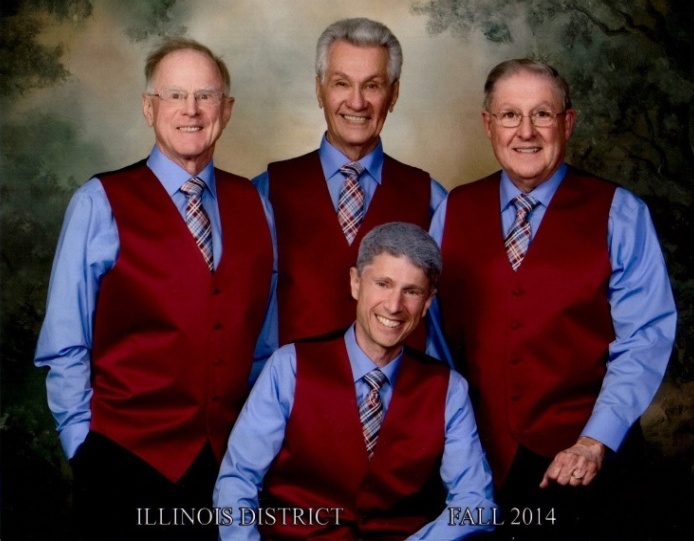 The Upside Downers Quartet is one of several barbershop groups with members from the Chorus of DuPage. They first performed on stage together in 2009 at the Sandwich Opera House with the West Towns Chorus. 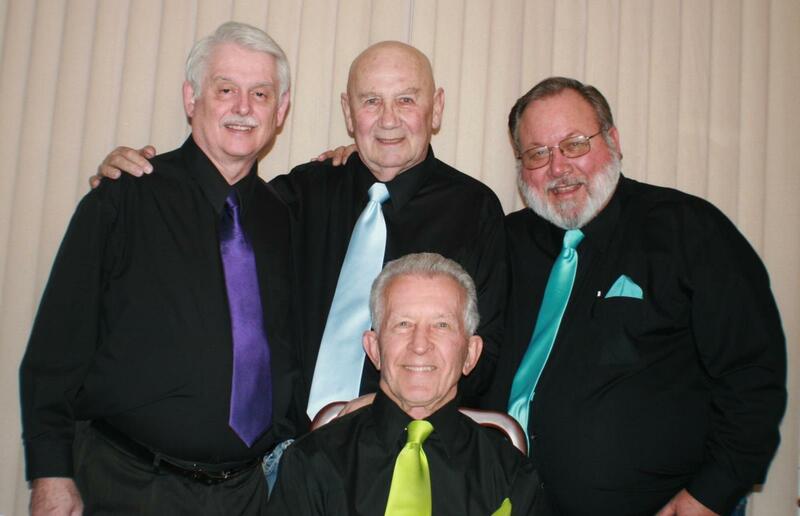 Their traditional barbershop songs are supplanted with a sprinkling of Doo Wop arrangements from a myriad of artists such as the Beatles, Van Morrison, the Turtles, Elvis Pressley, Johnny Cash, Billy Joel, & Deke Sharon. Members: John Oberlin (baritone), Bill Morgan (bass), Jim Morrison (lead)and Bruce Rhoades (tenor). Thoroughly entertaining, Jukebox has been performing together since 1996. Their song list includes numbers from Broadway, the 50’s and 60’s, barbershop favorites and comedy (especially comedy). Their stories are “G” rated and have been presented to hundreds of audiences over the years. If you would like them to perform for you, please contact Jim at 630-325-4953 or ahlgrim1@comcast.net. Jeff Gronemeyer sings the lead and sets the pace. He carries the tune and the rest of them along for the ride. Jim Ahlgrim handles the baritone and is a second generation barbershopper. He is celebrating his 53rd year in the hobby. Craig Ahlgrim is Jim’s son and sings the bass part. He is a third generation barbershopper, director of the Chorus of DuPage, and three time State of Illinois quartet champion (achieved with 3 different quartets). 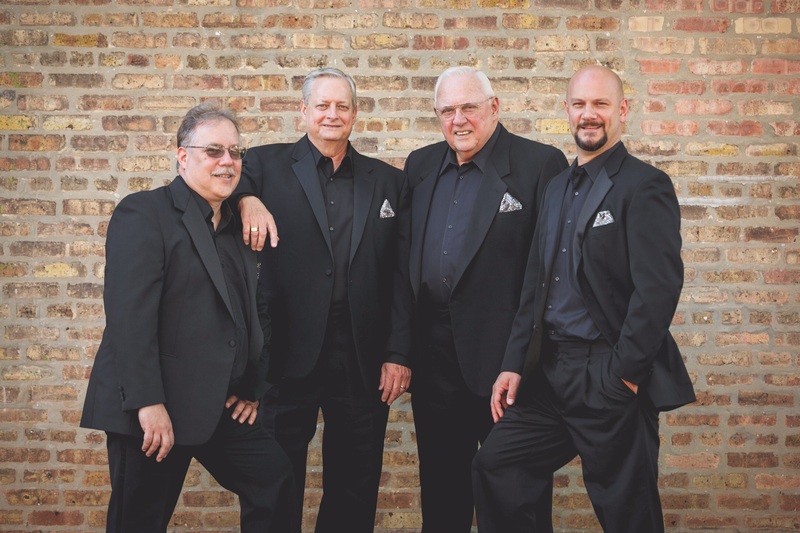 Jim Jarosz has earned his stripes as tenor of the quartet. He is a dual member of Chorus of DuPage and Chicago Metro Chorus. He enjoys arranging music into 4-part harmony. No Excuses! (Clockwise from front): Mark (Lead), Roger (Tenor), Jim (Bari), Tim (Bass). 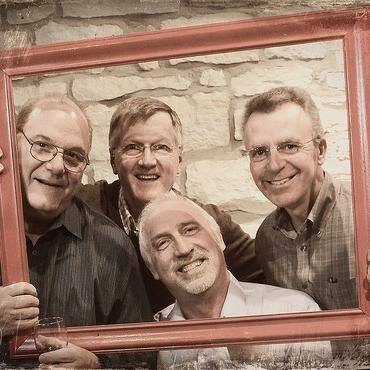 Registered with the Barbershop Harmony Society in August, 2014, this quartet focuses primarily on traditional barbershop songs, and barbershop-style arrangements of a few more modern popular songs. The guys are particularly happy that they work well together, and like the same kind of songs! Mark Barone is much younger than he looks in this photo - he sprayed silver in his hair when the quartet sang an old vaudeville song in an Illinois District contest! Mark has only been involved in barbershop for about two years, and is a member of the "at-large" Frank Thorne chapter. He has more formal musical training than the other three members of the quartet combined, as he has a degree in Music Education, and taught junior high and high school band for three years. Mark is married, with a son and a daughter, and lives in Montogomery, IL. He works as an inside salesman for a large provider of bio-hazardous waste disposal services. 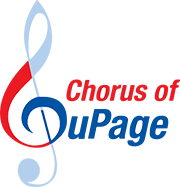 Roger Elliott has been a member of the barbershop Society on and off since 1981, and is currently a member of the Kishwaukee Valley (near DeKalb, IL) chapter. He was a member of a quartet known as Forte back in the mid-to-late 1990's. Roger is happily unmarried, works as a carpenter (that's why his thumbs are rather unsightly), and lives in Malta, IL. Jim Fourmont joined barbershop in 1969, and has been a very active member ever since. He is currently a member of the Chorus of DuPage, and the Aurora Lamplighters chorus. He has sung baritone with two seniors quartet champions in the Illinois District - Mashed Potatoes and Gravy, and Fox Sounds. Jim is married, and has lived in Aurora, IL, for all of his life (except when he was in the U.S. Marine Corps). He is a retired electrician, but still does various handyman jobs, primarily to pay for the barbershop sheet music he is constantly buying. Tim McEvilly has been a barbershopper for 27 years, first joining the Society in 1971, and is also a member of the Chorus of DuPage. He sang baritone with the well-known Accutones quartet, from the St. Louis area, for five years, then moved to the Chicago area in 1976, and sang baritone with The Candidates quartet, which won the Illinois District championship in 1977. Tim has been married to the same woman since 1962, has four grown children and ten grandchildren, and lives in Crest Hill, IL. He retired in 2007 after 44 years in business computer systems design and programming. Since then, he has worked part-time as a substitute teacher, at all levels from pre-school through high school.